(CNN) -- The people of Pakistan must back Islamic militants to counter the influence of the United States in their country or face punishment from God, Ayman al-Zawahiri, al Qaeda's second in command, said in an audio message released early Wednesday. Footage from a January 6, 2006, al-Jazeera broadcast shows al Qaeda number two Ayman al-Zawahiri. 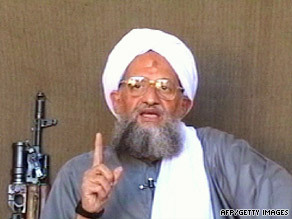 "I believe that every honest and sincere Muslim in Pakistan should seriously contemplate ... Pakistan's present state and expected future, because the blatant American crusader interference in Pakistan's affairs ... has reached such an extent that it now poses a grave danger to Pakistan's future and very existence," al-Zawahiri said in the message, which was released on radical Islamist Web sites. Zawahiri warned Muslims that they have a religious duty to support the jihad, or struggle. "If we stand by passively without offering due support to the mujahedeen, we shall not only contribute to the destruction of Pakistan and Afghanistan, but we shall also deserve the painful punishment of almighty God," he said. The Pakistani military is fighting Taliban militants in the country's north, and suspected U.S. missile attacks from drones have targeted militant leaders. Reports from the region suggest government troops have dislodged the Taliban from many areas of the North West Frontier Province, but militant attacks continue daily. Two government troops died and six were wounded Wednesday in the Bannu district when a bomb was detonated near a patrol, police said. A militant rocket attack near Peshawar about midnight missed a police checkpoint, but injured two civilians. Across the border in Afghanistan, NATO-led forces are battling the Taliban as well. U.S. and British forces recently launched offensives in Helmand province. This is the seventh message from al-Zawahiri espousing the views of the al Qaeda terror network in 2009. In addition to Pakistan and Afghanistan, the others have focused on Somalia, Yemen and Israeli military operations against Hamas leaders in Gaza.